Life is so crazy sometimes, it can be hard to relax. Especially with an almost-2-year-old live wire whose curiosity knows no bounds. Add in my efforts to build a career in the uber-competitive-but-so-worth-it fashion industry, difficulty turning down invitations to hang with friends, thrifting addiction, and desire to spend time with my man, and you know what? I'm exhausted. 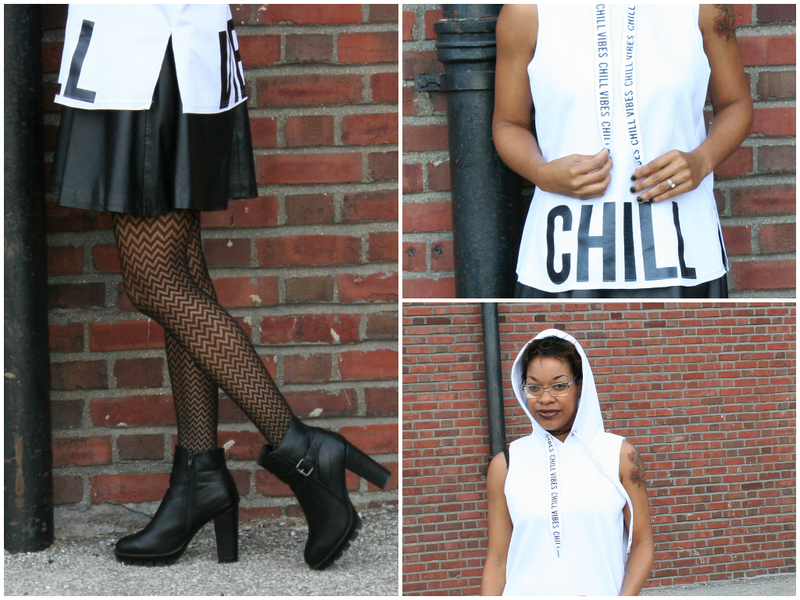 So, the message of this hoodie really resonates with me: CHILL VIBES. Getting lost in an SVU marathon or yelling at a Lifetime movie heroine's idiotic decisions (why does she always tap the bad guy once and run, as if he's not immediately going to get up and charge after her?) is strangely calming for me. Curling up on the couch with ice cream and an engrossing mystery novel also does the trick. Even a couple of deep breaths work in a pinch. Having a little one has taught me how essential relaxation is to one's sanity, so I never want to forget how to "chill." What do you think? What do you do to unwind? LOVE that skirt!!! I need one like that! Thanks, Jill! It was a very lucky clearance find from Tarjay, and definitely goes with a lot of tops.